In a desperate effort to improve its sales, Norton - already in serious financial difficulties - let itself get carried away in 1974 by a project devised by Dennis Manning. 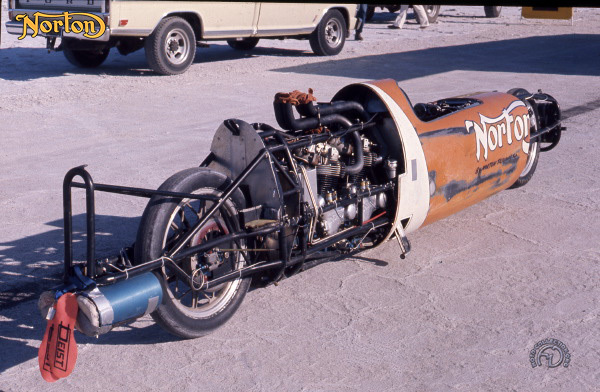 The American, who in 1970 had built a "flying cigar" for Harley-Davidson with which Cal Rayborn had set a record of 265.5 mph, promised Norton that he would establish a new world two-wheeler speed record in Salt Lake City, Utah. Knowing how powerful the Harleys were, Manning was convinced that he could get more power output by coupling two tuned Norton Commando 750 engines in tandem. Having convinced the factory, he recruited the aid of dragster ace Tom Christenson, whose "Hogslayer" (also powered by two Commando engines) was then the dominant force on American drag strips. While "TC" built the running gear (which operated on a secret alcohol-based mixture), Manning constructed a new cigar-shaped shell in which the rider sat ahead of the engines, keeping frontal area to a minimum. Unable to master his bike, he turned to veteran dragster Don Murray - who also had trouble controlling the machine at speeds of 300 mph. Don Murray tried again after a highspeed accident, reaching 271 mph in one direction. Engine problems prevented him from making the return run that would have secured the record. Still bearing the scars of Don Murray’s high-speed accident, the Norton streamliner is shown being readied for its final attempt on the world twowheeler speed record.